The world of speech-language pathology licensing can be a bewildering one. While most folks in the special ed biz seem to have a good understanding that the ASHA C’s are a must when hiring an SLP, things get much more murky when looking at the licensing requirements of a particular state. This is because, while the CCC is a national certification, they are not a national license. Should we have national licensure? Well, that’s another topic for another day (IMHO, the short answer is “duh.”). But as it stands today, each state maintains it’s own unique requirements for licensing, which means that an SLP must have their C’s and a license in every state in which they practice (yes, even telepractice). And then there is this issue of The Shortage. Does it exist? Yes, it absolutely does. But it isn’t evenly distributed across the country. Some regions, especially those that are more rural, are in much more dire straits than those in urban centers and those with graduate programs in speech-language pathology. So what’s a special education admin to do when they’re trying to recruit both in-state and out-of-state SLPs? What’s an SLP to do when they’re looking for that perfect job? Enter our . 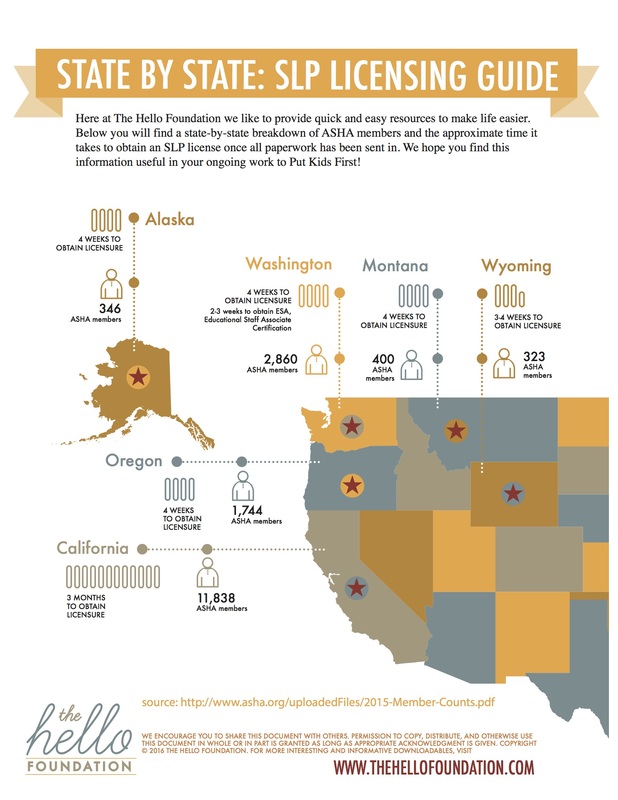 . .
We’ve assembled ASHA member data and information obtained from state licensing agencies and combined it into this handy infographic for the 6 states in which we currently work (Alaska, Washington, Oregon, California, Montana, and Wyoming). We think it’s a helpful quick reference for . . .
Special education admin who are recruiting out-of-state and need to know how long a license will take in your state. SLPs moving to a new state and need to know how long licensure will take in their new state. Special education admin who are wondering how many SLPs are theoretically available in their state. SLPs evaluating the potential job market in different states. for printing and sharing in staff meetings and whatnot. And please share it via the social buttons below if you know of others who might like it, too! As always, we hope you find it useful and welcome your thoughts via email, Facebook, Twitter, and Instagram.